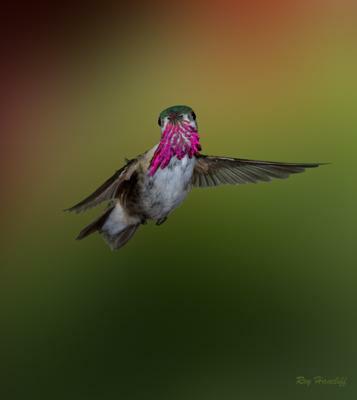 Here in BC Canada we also have long cold winters and knowing that the Hummingbirds will arrive in early April gives us something to look forward to. They are truly amazing birds that fly up to 2000 miles to be with us through quite often horrendous weather conditions. We plan our front deck with them in mind. We hang around 6 feeders mixing the nectar ourselves. We created a water feature out of a wine barrel so that they can take a shower which is such fun to watch. There are hanging baskets to entice them and various pots with flowers such as Bee Balm and Fuchsias. One word of advice if I may it is imperative that all feeders are kept scrupulously clean, every 2-3 days and if the nectar is not finished throw it away and start again, especially in hot weather. I create an outdoor studio with 4 Nikon SB600 Speedlights, one of which lights a backgound. My settings are ISO 200, F16-18, 250 Sync speed. The camera I use now is a Nikon D3S and the lens is a Nikon 200mm F4 AF Macro. Can't believe we just saw the first hummingbird so early this year in Mission BC. It is only February 2rd. Have to get a feeder, it is been colder the last few days. Thank you for the info. We just witnessed a hummingbird at 9:30 am, on February 26th, 2013. The hummingbird was at our feeder, a couple of times.